I myself got involved in drawing ornaments on a computer quite early. On this page you will find on the one hand a little personal history on the development of ornament drawing programs. You will also find a small collection of other resources that I find very useful in that context. I myself got involved in the topic of ornament drawing on computers already some decades ago. In 1986 there was a big exhibition in Darmstadt (were I studied mathematics at this time) all centered around the topic of symmetry. The exhibition was highly interdisciplinary and involved physics, biology, chemistry, art, literature, dance, music, architecture and, of course, mathematics. At that time as a student assistant I was asked (in collaboration with Prof. Bernhard Ganter) to develop a program with which a visitor could explore the 17 wallpaper groups by drawing ornaments. The installation at that time was realized on an ATARI 1024 ST computer which was a quite impressive devise (in 1986). The original ornament program was a very well frequented exhibit. Later, the program was ported to a Windows environment by Rüdiger Krause and a modernized version of it is still in use in the Erlebnisland Mathematik a mathematics exhibition in Dresden run (among others) by Bernhard Ganter. Darmstadt is, by the way, very well known for its Art Nouveau area (this is where the symmetry exhibition took place). This area involves a lot of architectural ornamental art as you can see in the picture of a house wall above. A point, where I seriously got involved in interactive mathematics on computers a second time was when I started the Cinderella project around 1992. Cinderella started as a program for doing geometry on a computer and was first meant as a kind of input interface for a geometric theorem prover that I developed during my PhD. 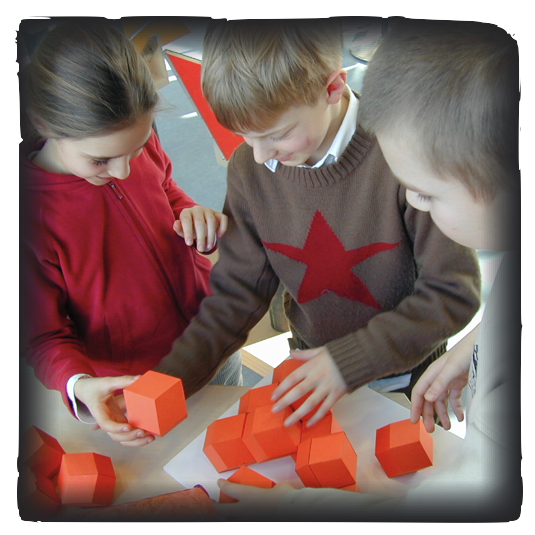 However, it also turned out to be a very versatile tool for teaching and communication of mathematics. The first version was developed (jointly with Henry Crapo) on a NeXTStep platform. After the decline of NeXTStep the program was since 1996 continued under a Java framework jointly with Ulli Kortenkamp. Over the years Cinderella became more and more powerful. By now besides a very strong and mathematically consistent geometry part Cinderella also contains a general purpose functional scripting language as well as a physics simulation engine and an interface for sound generation. 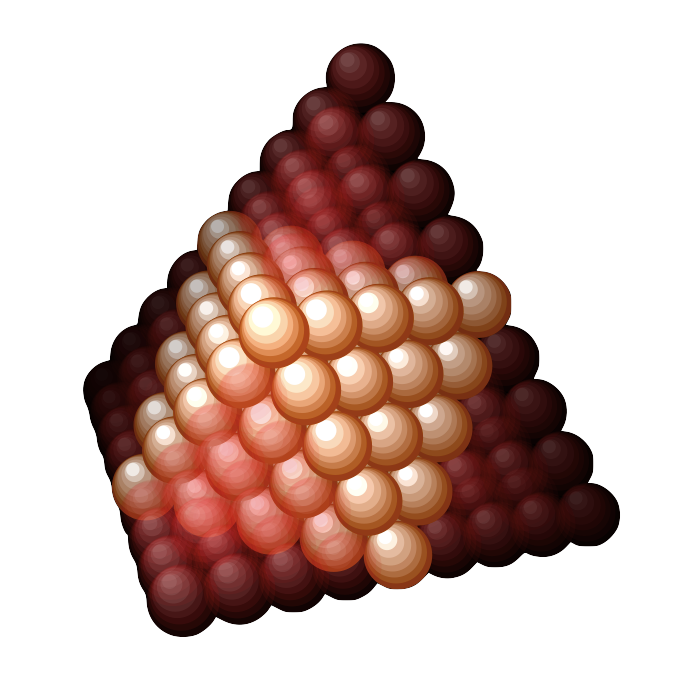 In the meantime it can be considered as a quite general tool for mathematics visualization. The current Cinderella distribution also contains tools for the generation of geometric symmetry groups and of fractals. In contrary to iOrnament, which focuses more on the artistic aspects, Cinderella can be used to create very sharp geometric ornamental designs. The picture above shows an ornament that was created with Cinderella within just 4 minutes (I admit this is a quite untypical application of the program). When I started my position at TU Munich as a professor for geometry and visualization in 2001, I was offered the opportunity to equip a mathematics exhibition at our campus in Garching. The exhibition is actually a quite small room of 9m times 9m, but we tried to equip the room with many exciting possibilities for hands on experiences in mathematics. The size of the room finally gave the exhibition its name (read ix as a Roman nine). The ix-quadrat presents side by side classical mathematical models, hands on experiments and interactive computer installations. Symmetry is an important topic in the exhibition and as you can guess there is also a program for drawing symmetric ornaments. This program was written in java by Martin von Gagern, at that time a computer science student in its second semester and very talented. He spend a lot of effort in fast rendering techniques. Experience showed that this kind of program can be extremely attractive to our visitors. You can access the program within a browser from Martins morenaments project. Since 2007 I started Mathe-Vital. 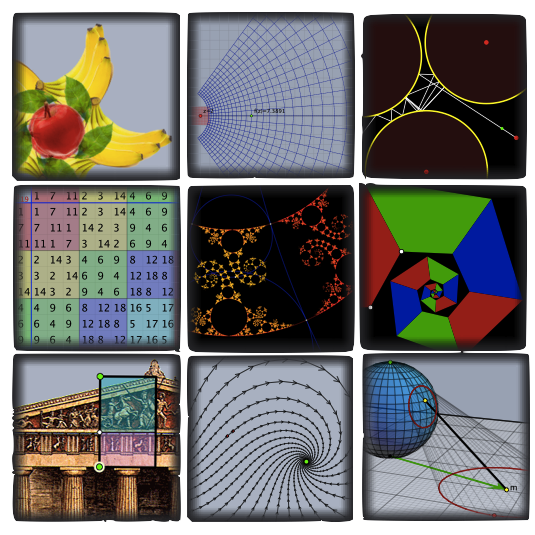 This is a constantly growing collection of interactive mathematics and physics visualizations that are tailored to support teaching mainly at a university level. There are, for instance, collections of applets that support classes in linear algebra of in projective geometry. In the meantime the collection covers approximately 500 different applets. Besides its focus on university mathematics it also contains courses that are more headed at a general audience. For instance there is a course on mathematics and plant growth or another course on the relation of math and music. The collection is constantly growing and it is planned to also provide materials for teaching mathematics on a school level. The technical backbone of Mathe-Vital is Cinderella. The experience on interactive visualization that could be collected via Mathe-Vital is also very important for science-to-touch. There was a very special event in germany in 2008: The Year of Mathematics. This was a year full of mathematical activity for the general public. This year was the launch of the very successful exhibit Imaginary. This exhibition was initiated by the Mathematical Research Center in Oberwolfach and focuses on the beauty of mathematics. It consist of high quality printouts mainly of algebraic surfaces together with several interactive computer installations with which the visitors can, for instance, create their own algebraic surfaces. A collection of visualizations made with Cinderella were part of the exhibition since the very beginning. So far the exhibition visited more than 50 different places all over the word and by now has several interesting spinoffs. One of them is the MiMa Museum for Minerals and Mathematics a specialized collection that exemplifies the interrelation of math and crystal growth. There are various relations from this topic to iOrnament since crystals as well as ornaments are very regular structures. Another project that was undertaken jointly with the imaginary team is an interactive installation on three huge touch screen monitors for the Deutsche Museum in Munich. This was the first occasion where I seriously had to think about the advantages and disadvantages of touch technology in science communication. On one of the screens you can find a collection of 32 Cinderella applets. One of them is an ornament drawing program that is stylistically already very close to iOrnament. Finally, I want to mention a research project that is joint work with Martin von Gagern and is very closely related to visualization of planar ornaments. There are by far more mathematical types of ornaments then the 17 ones that correspond to the wallpaper groups. However, they do not fit into the usual euclidean plane. Instead one has to embed them into the so called hyperbolic plane. This mathematical structure, whose discovery was a real sensation in the 19th century, can be represented by the interior of a circle if circles perpendicular to the boundary are considered as straight hyperbolic "lines". In a certain sense the hyperbolic plane has way more room than the euclidean plane and as a consequence in the hyperbolic plane there are infinitely many possibilities to have ornament groups. Martin and I have developed a method that allows to automatically transform Euclidean ornaments to corresponding hyperbolic ones. The above picture was generated by this program from an iOrnament drawing. We wrote a research article about it that explains the method and contains many beautiful pictures of ornaments. Martin investigates hyperbolic ornaments further in his morenaments project and in his PhD thesis. On the internet you can find numerous resources in the context of ornamental drawings or tilings. Listing them all or even a representative portion of them would be by far bound the scope of these pages. However, here I at least want to mention a few resources that may be an inspiration for ornamental design in the context of iOrnament. Craig Kaplan is a professor at the Computer Grohics Lab of the University of Waterloo. 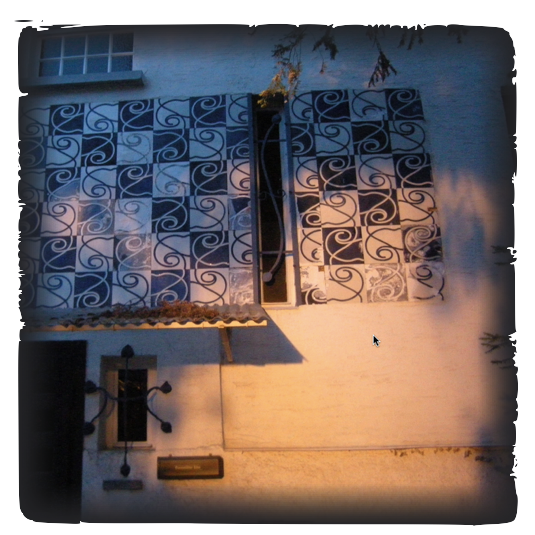 He has worked intensively on various aspects of tiling theory. On his homepage you find many interesting resources that might be of interest and an inspiration for the drawing of ornaments. In particular, he presents methods and algorithms with which you can take some silhouette with a picture on it that should serve as a basic tile for a periodic ornament. 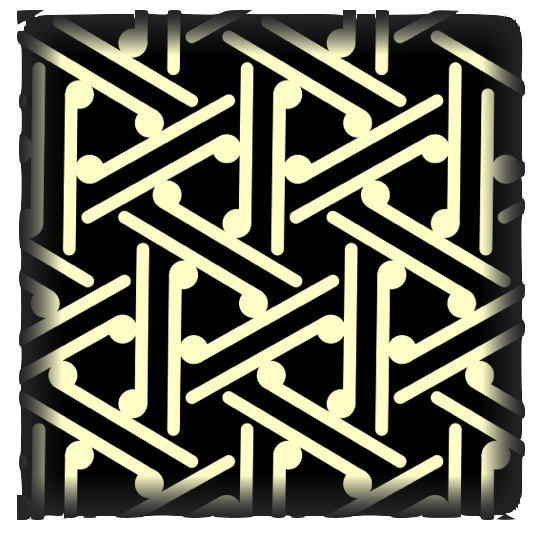 Kaplans algorithms will try to deform this tile minimally such that it fits perfectly as a tile for a symmetric ornamental tiling. 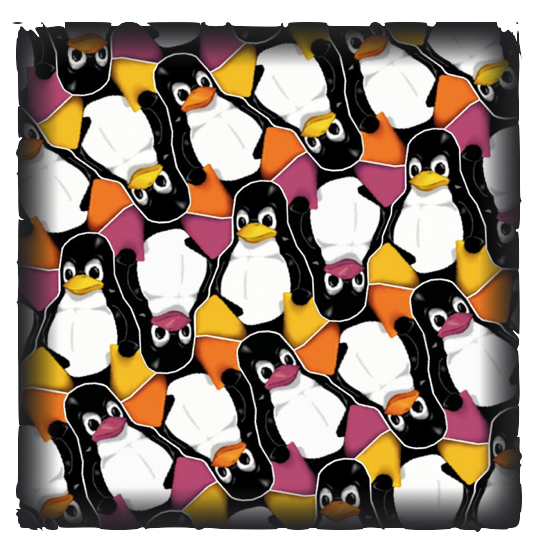 The Linux Penguin above underwent exactly such a procedure to become the fundamental part of a regular tiling. 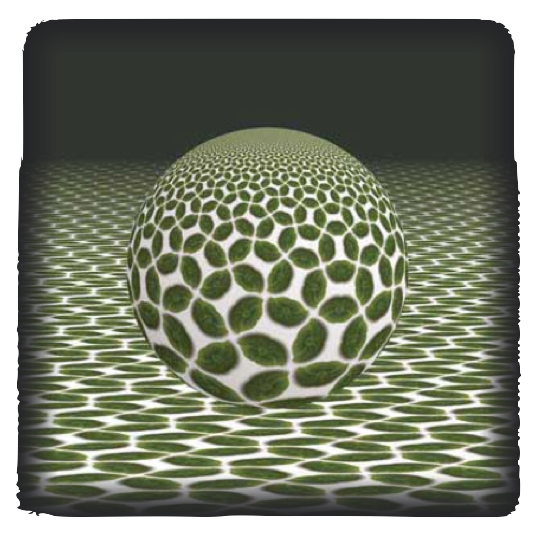 On Craig Kaplan's homepage you will also find material on morphing some tiling to another, on hyperbolic versions of islamic art and on quasiperiodic tilings. Vi Hart calls herself a full-time mathemusician and provides extremely inspiring resources for many types of (deep!) recreational mathematics. The topics range from number theory over topology, calculus, to geometry and algorithmics. In particular she provides very inspiring videos, on "math doodling", i.e. the art of creating hand drawn pictures of mathematically interesting structures. The videos are at the same time informative as well as highly entertaining. 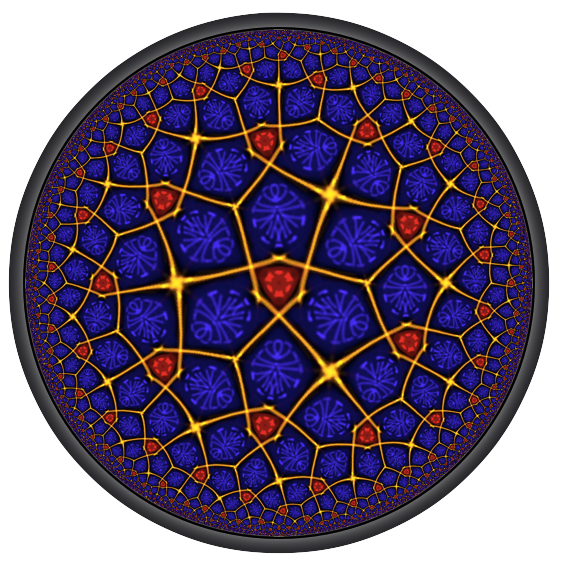 It is fascinating to combine some of the techniques presented by her with the possibilities of iOrnament. 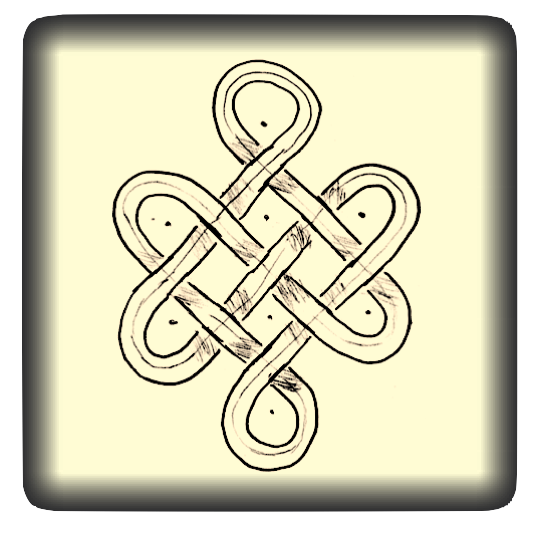 For instance, you may have recognized that in our gallery there are many images of infinite knot like structures. These structures can be considered as applying the techniques you find in the following video to iOrnament. The video is about the creation of several types of knots an weaving structures. I can also recommend to doodle yourself with a sheet of paper a sharp pencil and Vi's ideas in mind. There is (at least) one book that I want to recommend in the context of ornaments and symmetries. The book "The symmetries of things" by Heidi Burgiel, John H. Conway and Chaim Goodman-Strauss that appeared in 2008. It provides extensive background material on the possible symmetry structures of geometric objects. In particular, the book has many fascinating illustrations that exemplify the different structures. Also in the context of ornament theory there is a lot of exciting material in this book. For instance the authors present a proof that there are exactly 17 wallpaper groups. Also the orbifold symbols that play a crucial role in iOrnament are treated extensively. Moreover, symmetry groups in hyperbolic planes and spatial symmetries are explained and classified. Also in a more artistic context there is a variety of inspiration that can be found on the internet. I here want to mention two of them that have been of much influence for me. One of them is the classical book The Grammar of Ornaments by Owen Jones that was first published already in 1856. It contains a lot of color drawings of a variety of ornaments of various cultures. iOrnament contains a selection of those ornaments as examples for the 17 wallpaper groups. Secondly, one must mention the famous Dutch artist M.C. Escher who was a master of creating intriguing tiling patterns. You can find many of Escher's planar subdivisions on various places over the internet. It is an challenging task to take one of Escher's drawings and use it as an inspiration for your own design for an Ornament. 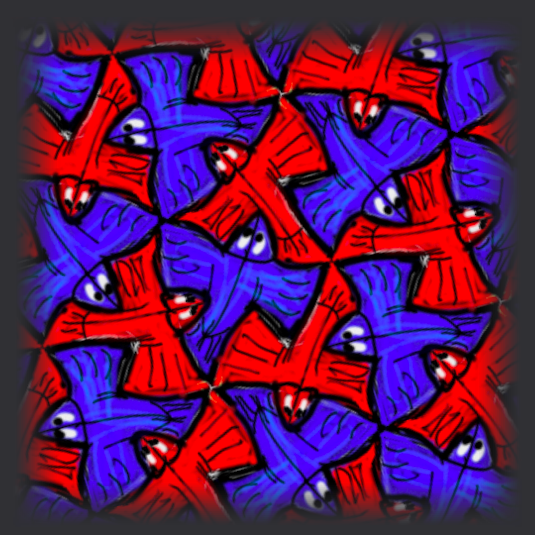 The picture above was generated with one of Escher's tilings in mind.